I don't think I've ever met a child that didn't enjoy getting candy in their stocking for Christmas. Heck I'm an adult and I still love getting candy around the holidays. The people at CandyWarehouse are so serious about candy they even have an entire section of the website dedicated to just Christmas Candy. 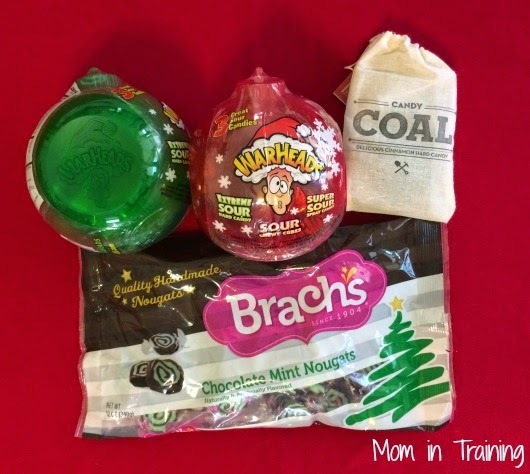 There are so many different kinds to choose from: candy coal, chocolate mint nougats, candy canes, lollipops, you name it. They also have a ton of your typical every day candies like Jelly Belly's and M&M's in Christmas colors. There's truly something for every type of candy lover out there, even super sour WarHeads! When my kids saw my package from the CandyWarehouse they were all sorts of excited and wanted to know if it was for them. We don't do a whole lot of candy around the house unless it's something we got from a holiday party or someone gave it to us so this was a pretty big deal to them. They couldn't wait to rip into the WarHeads candies and see which one of them could keep them in the mouth the longest without opening it. Even candy can be entertaining and fun! Don't have any stockings to stuff this year? Don't worry they even have a section of Christmas party supplies filled with awesome candy holders, balloons, bags, decorations and more. Buy it: You can purchase these stocking stuffers and more directly from the CandyWarehouse.